You may not realize you need a yoga resume, but you do. In order to secure a job teaching in a studio, fitness club/gym, school or at home, your potential employer wants to know if you will be a good match for their business. In order for an employer to get more butts on their mats, they must hire instructors that complement, challenge, and offer possibilities for the development of their community. Just like any other business, an employer is looking to answer the question, “why should I hire you?”. Whether you have quit your day job and are fully entrenched in your yoga career, or you are a part time instructor and maintain a career off your mat, your yoga resume is an integral tool to secure work. With over 50% turnover rate in the fitness industry, instructors are focused on recouping their training investment. Even if you taught 2 classes a week, you would spend almost a year of your life teaching for FREE! Most often, if you want to get hired at the place that suits your style for the long term growth and potential of your brand, then your resume must clearly communicate that on paper. This is your opportunity to showcase who you are as an instructor and what your unique style offers to students. So…Where do you start building your resume? A resume is meant to spotlight what you accomplished. No one wants to read your job responsibilities. Ensure your formatting is consistent, easy to read and uncluttered. Begin each bullet with an action verb. Action verbs illuminate the key impact/experience you have had in a clear, concise language. What will you bring to our space? Where have you experienced successes in your life? When developing your yoga resume, include the following 5 “must haves”. What part of TEACHING yoga do you feel comes most naturally to you? How do you inspire and support others in their yoga journeys? How do you feel at the end of a great yoga class? How do your students feel when they leave your class? A results-oriented, strong community leader with sales and marketing experience, family health and wellness certifications which include yoga, cycling and personal training. 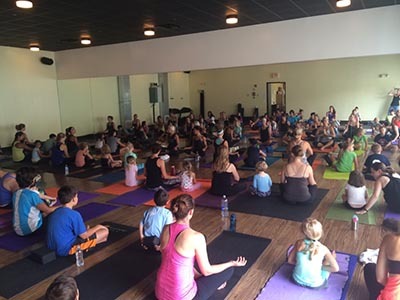 Co-founder and Co-Owner of FamilyFlow Yoga®, a family mobile yoga studio, that’s one of four schools in Illinois to offer a 95 Hour Registered Yoga Alliance Children’s Yoga Teacher Training program. Major strengths include marketing, strategic planning, people management, training sales personnel and brand marketers, presenting sales reports and proposals, as well as coaching, focusing and counseling a diverse group of students that extends to encouraging healthy family balance. While teaching in yoga studios, fitness clubs, boutique studios, as well as in school and after school yoga programs. Must Have #2 Current and Previous Employment History/Career Highlights. Yes! Career Highlights feature particular successes that contributed to your achievements. Format this section to easily discuss your career highlights and key facts. Prioritize the most important facts by role and include quantifiable bullet points. Limit each position details to 3-5 action-oriented bullet points with focus on what you learned and how you apply it. Avoid name dropping or comparison thinking. Emphasize your strengths as a teacher. Led a team of 35+ Yoga, Pilates, Group Fitness Instructors and Personal Trainers. Fashioned new pricing structures which included a strong focus on multi-tiered membership. Increased overall revenue of OPRF studio through schedule optimization, strategic hiring and expanded community partnerships. Developed, delivered and measured brand and non-brand member programming. A traditional resume puts the work experience section above education, but if your education is more compelling, list it first. This is especially important if your education background is in the health and wellness field. Include the styles of yoga you’re certified to teach and have copies of all your certificates handy. Mix in higher education information, degrees earned, insurance, CPR/AED, etc. Spotlight your “off the mat” experiences that contributed to your growth. As yoga instructors, we have more physical work that doesn’t include a desk or computer. However, it is still helpful to list a few technical skills, especially if you want to work in a fitness boutique or studio that incorporates digital tools, such as scheduling programs or video classes. Sprinkle in any supplemental experiences, outside of teaching yoga, that may add to your repertoire. Accentuate your community Involvement, other outside interests, etc. You can even get a lil creative and incorporate testimonials from previous and current employers or students. For many yoga instructors, soft skills are as important as hard skill sets. Here, you can include the amount of time you’ve been practicing yoga and how many hours you have spent teaching yoga. Most of our experiences as instructors are rooted in mindfulness, meditation and relaxation as well as the ability to communicate and customize your sequences to meet an individual’s needs. Focus on volunteer work, internships, or apprenticeships. Articles or blogs you’ve written that apply to your passions. I supply a yoga resume for every career opportunity that comes my way, even if it isn’t requested. You don’t gain a job from a resume, but it should land you an interview or audition. As you evolve as a Yoga instructor, it’s important to refresh your resume to reflect your style. References available upon request. Adrienne started practicing yoga when she was working in the corporate world. She traveled constantly and always looked for ways to keep healthy and active while on the road. After completing her RYT-200 Power Yoga Teacher Training she was hooked! She completed her RCYT-95 as well as her RYT-500 Advanced Yoga Teacher Training. A mother of two girls, Adrienne has dedicated her time to deepening her practice and connecting with her students (especially families & kids!) on ways to allow their yoga experience to ripple into all aspects of their lives. Throughout Adrienne’s trainings, her passion has led her to co-found FamilyFlow Yoga®️. FamilyFlow Yoga®️is one of four accredited schools in Illinois to offer a 95 Hour Registered Yoga Alliance Children’s Yoga Teacher Training program. Adrienne teaches in yoga studios, fitness clubs, boutique studios, as well as in school and after school yoga programs. 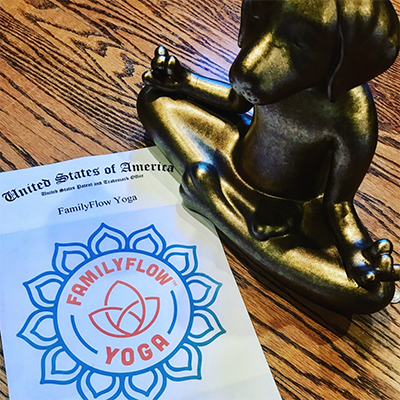 FamilyFlow Yoga®️ has become an expert in offering continuing education programs and workshop for yoga instructors as well as schools’ staff and administrations. She's committed to helping people reach their full potential both physically, mentally and emotionally.